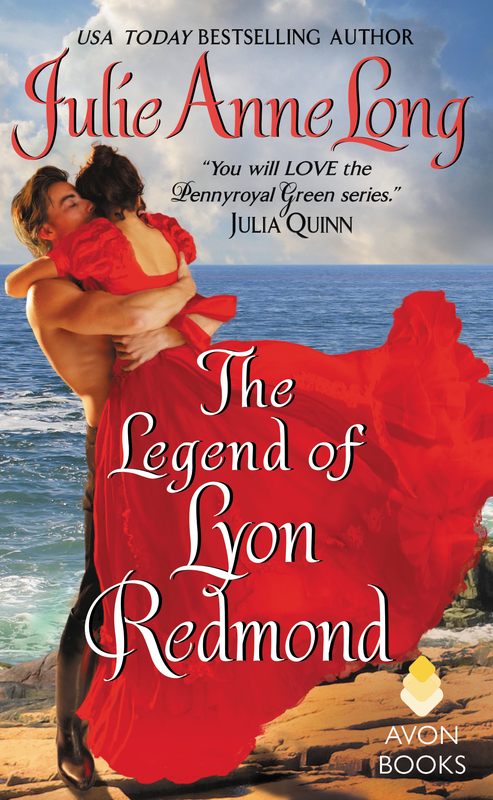 Throughout all of the numerous books of the Pennyroyal Green series, we have been teased with tiny glimpses of the ill fated love affair of Olivia Eversea and Lyon Redmond We only know that they parted years ago, Olivia went into a decline, and Lyon disappeared. Olivia turned down suitor after suitor, and no one knows where Lyon is, or if he’s even still alive. Finally, five years have passed, and Olivia has decided to come back to the living. She has accepted the proposal of a viscount, and the date is set for them to marry. Someone, though, does know where Lyon is, and owes Lyon his very life. He gets a message to Lyon, telling him that Olivia is about to wed. After all this time, and all that he’s done, just hearing that Olivia is about to give herself to another man pierces Lyon’s heart. He can’t let her marry another, not without a face to face confrontation. So, he devises a plan to meet her, and convinces a shellshocked Olivia that they need to have a conversation, and he requests they have it in private, aboard his ship. She agrees, and finally they confront their past. Personally, I have been desperately waiting for this story. I wanted the details of how they met, how they fell in love, and what parted them. Their story is told in flashbacks, skillfully intertwined with the present time. And it is a breathtaking story. If love at first sight does exist, this is a genuine example of it. They were both so young, and had an innocence about their relationship, though make no mistake, there was passion. Because of their feuding families, they had to meet in secret. When an ultimatum is issued that will affect their future, a life altering decision has to be made on the spot. Fear and doubt creep in, and the lovers are tragically parted. What a magnificent job Julie Anne Long has done! You feel their joy when they first fall in love. You feel their anguish as they part. The most wonderful thing is that at their reunion, they did not snipe and try to wound each other further. They TALKED, and it was beautiful. This reunion, though, was not the resolution. The next series of events that leads to their happy ever after was picture perfect. I am a big fan of epilogues, and THE LEGEND OF LYON REDMOND has a very unique one. No spoilers, but it was unlike any I have read. Quite honestly, I have mixed emotions about it, though the information it provides is invaluable. In conclusion, this book is worth the wait. It’s powerful, emotional, and passionate and will be one of my favorites of this year. While one could read and follow the story without having read the rest of the series, all of the mystery and anticipation building up to this grand finale certainly adds to its appeal. I fell in love with both Olivia and Lyon, and I so love this book, that I am ready to go read it again, though I just finished it. Julie Anne Long is a gifted writer, and the whole Pennyroyal Green series has been a joy to savor, with this being the pièce de résistance. This is a series I must read!